Bottom Line: a notable improvement upon the still popular and somewhat recent Debut bookshelf speakers. Power specs are still somewhat modest. Also still on the expensive side, but could be well worth it for some. Others will find better value elsewhere. 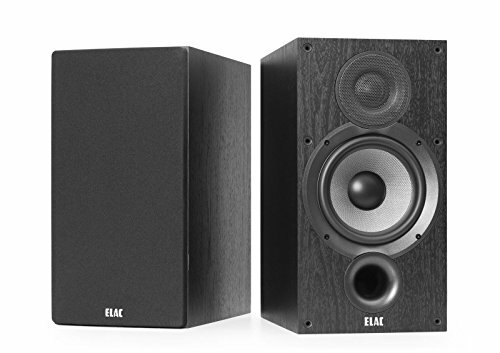 Elac’s aptly named Debut 2.0 speakers are an updated version of their still somewhat recently released Debut lineup. The original Debut lineup was designed by renowned audio engineer Andrew Jones with the goal of producing truly audiophile caliber speakers at an affordable price. The original lineup was an improvement upon similar budget-tier speakers he previously designed for Pioneer, which is where Elac subsequently recruited him from. The original Debut bookshelf speakers have been highly praised and still remain strong sellers. How do the new Debut 2.0 improve upon them? And are these new generation speakers worth a premium? That’s what we’re discussing here. The Debut 2.0 bookshelf speakers similarly come in two different sized versions with a standard 5.25 or 6.5 in woofer respectively. Other than that, and a few minor spec differences, the overall design between the two is the same, hence our joint review herein. The first significant design change is that they moved the port to the front. While a back or downward facing port isn’t technically inferior (most ported speakers use those directions), the issue is that the speaker becomes harder to place in order for the port to function properly. A front facing port gives the flexibility for a user to flush these speakers into a wall or shelf without compromising the design, which is actually a nice option for the layperson who can’t angle their speakers on stands for example. The second significant design change is an upgraded woofer material. The Debut 2.0s use a proprietary woven cloth/fiber blend that has the propensity to be very stiff and light and perform better than a polymer or metallic driver, especially at closer range and lower volume. The disadvantage of cloth drivers is that their more prone to damage and wear and tear. This is somewhat a concern with Elac’s mere 3 year warranty on their passive speakers. That coverage isn’t bad, but it’s comparatively worse to the much more standard 5 year warranty on passive speakers. The third significant design change is the tweeter is slightly pushed out and thus has more dispersion, which sort of contrasts with other speakers that are horn loaded and intended to point exactly at a single sweet spot. This complements the front facing port in that it makes speaker placement all the more flexible. Other than that these speakers have a few minor improvements/changes. The MDF cabinet has been revamped, and is slightly bigger to accommodate the port being on the same side as the drivers. They are each slightly bigger and heavier than their predecessors, but not exorbitantly so. Lets talk specs now – the Elac speakers honestly have pretty modest power specs. A ~36 W* 2-way bookshelf speaker isn’t going to get extremely loud, and similarly priced units from Polk, Klipsch et al boast multiple times more power for the same price, and also have components that prioritize loudness. But a louder speaker doesn’t necessarily sound better, especially if you’re going to be listening at close/mid range. The response range is actually quite decent for a 2 way bookshelf speaker. An unusually high ceiling of 35k Hz is well above what a human can hear and might seem pointless, but a high top end also implies a low bottom end, meaning the tweeter will sound good all the way up to the crossover point (2200 Hz). A lower crossover point also allows the woofer to really focus on the mid range as well have more berth to focus on the bass. 2 way bookshelf speakers will always be limited in the bass they can reproduce and are generally optimized/intended to be paired with a subwoofer, and the Debut lineups both indeed have subwoofers in them. Also note that Elac doesn’t specify a response variance – it’s fair to assume the bass will start to drop off above the quoted 44-46 Hz floor, but this would become irrelevant if a subwoofer is added with a second, higher crossover. These speakers look really great, even better than their predecessors. The gray basket has been changed to a darker color that blends better with the cabinet, while the new drivers now contrast with the front panel in their own distinct gray color. Or you could choose to put on the included foam-grill covers, and these wind up looking like pretty boilerplate bookshelf speakers. We’re not sure why Elac decided to revamp the debut lineup when the original release is still quite popular and just not all that old. But, the design improvements are significant and pertinent to the target consumer we think. That said, a well built fiber/cloth driver has the propensity to sound really great at close/mid range in a way that a polymer or metallic driver couldn’t. Andrew Jones wouldn’t put his name on a third iteration of a speaker that he didn’t think sounded up to par. Our final verdict is that these will be worth the money for some who give them a listening test, but that for others better value can be found elsewhere. Also worth mentioning is that the older Debut speakers, which are pretty much just as decent, might be able to be acquired for very cheap due to their now legacy status.